(from Cairo) 300thousand students, 17 thousand foreigners, over 70 faculties (separate between men and women), 6 theological faculties in Cairo, approximately twenty across Egypt. A widespread, complex structure inhabited by Salafists, Muslim brotherhood, Sufis and liberals (non practising Muslims) with primary and secondary schools present nationwide. They are not madrassas nor Koranic schools. They are places of learning, with religious, classical studies, and most of all, free of charge. Pope Francis knocked at the doors of this boundless realm in April 2017. The relations between the Holy See and al-Azhar were resumed since then, after having been interrupted for a long time. Meetings ensued also in Rome between the Pope and the Grand Imam Ahmad Muhammad al-Tayyib. The threads of this delicate dialogue in Cairo are woven by the Dominican friars of the Dominican Institute for Oriental Studies (IDEO). The beating heart of the centre is an immense, modern, well-kept library. A veritable treasure of Arab and Muslim culture and history, that features 150 thousand volumes and 1800 different specialist journals. 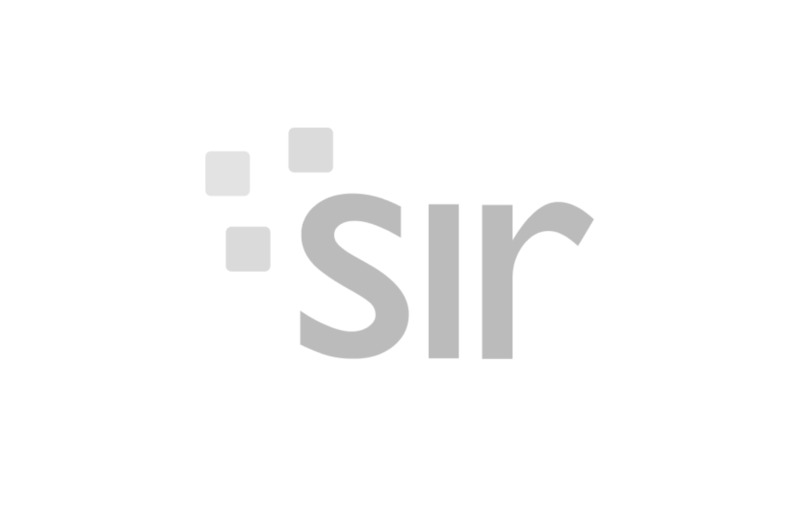 Father Jean Druel serves as Director of IDEO. We met him for an interview. 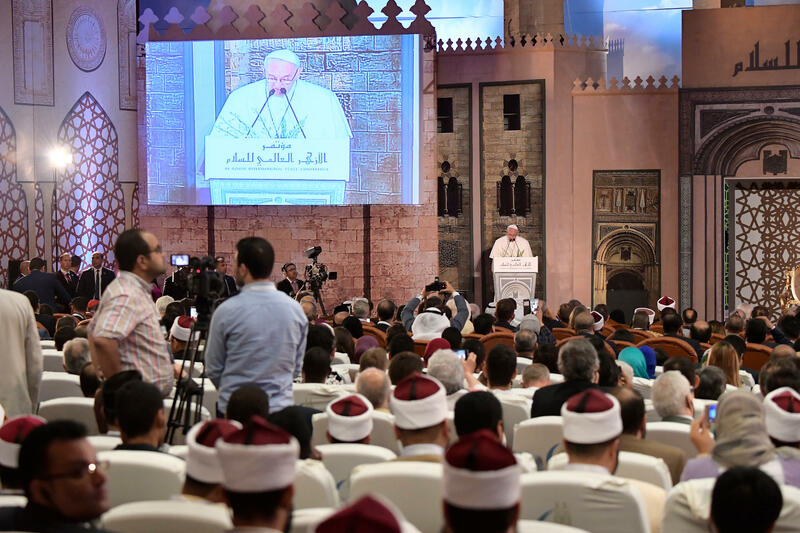 After Pope Francis’ visit what has changed in the relations between the Catholic Church and al-Azhar? This relationship involves four players, each with their own agenda. The first is obviously Pope Francis. His goal is to fight against Islamophobia in the Christian world and show Catholics that we are not at war with Muslims. The other player is the President of al-Azhar, Ahmad Muhammad al-Tayyib. His aim is to convince the Muslim population worldwide that he is the Pope of Islam. The third player is the Pontifical Council for Inter-religious Dialogue, whose goal is to carry out a joint reflection with Muslims on the root causes of religious violence inherent in sacred texts with the purpose of identifying, analysing and working on them. The fourth protagonist is Egypt and al-Sisi, who has an urgent need to show the world that his is a safe Country and a safe place for tourists. Amidst so many central players, what’s the good news? The good news is that Francis has sent a powerful symbolic message to the Christian world: we are not at war with Muslims. 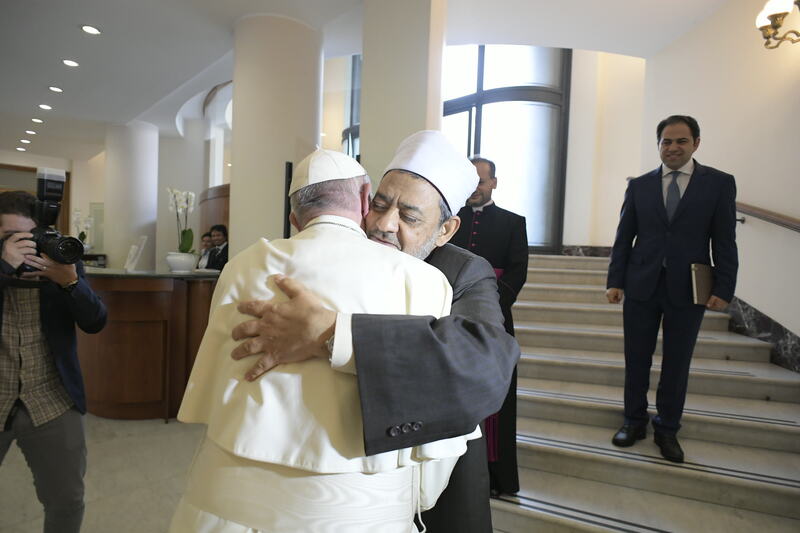 This is important, for if the Pope and the Catholic community see Muslims as enemies, dialogue and encounter promoted at local level become very complicated. The problem is that this can’t be said for Muslims. First of all because al-Tayyib is not the Pope of Islam. So if I am a Muslim and I see al-Tayyib with Francis that image will leave me indifferent. If everyone has different viewpoints and goals, what are the common grounds for dialogue? Why do you consider it to be false? but the fact is that they don’t know anything about each other. As a result, ever more often we are told that dialogue is useless. Before this claim my question is: what are you doing to engage in dialogue? You have Muslim families living in your neighbourhood. Have you ever tried to talk to them? Are you open to bring into question your clichés and go out to meet your fellow others? How can dialogue advance within such a wide and complex Islamic world? with those who share our traditional interpretation of the world. But this does not reflect the truth. The Muslim way of reading the Koran, for example, is radically different from the way in which Christians read the Bible, and we can’t expect these two different approaches to be the same. On the one side we have a literal interpretation of the Koran, on the other a historical or critical reading of the Bible. How can these two approaches be reconciled? Univocal reading is when we think that the oneness of God should be reflected in a univocal reading of the sacred texts, of the community, of thought and of life. That’s what fundamentalism does, and it happens in all religious traditions. But – as a Muslim recently told me – God’s infiniteness is such that it’s impossible to define Him univocally. In fact His infiniteness is manifested in the infinite range of approaches and sensitivities. How can the risk of fundamentalism be averted? We must teach the love for diversity. People are afraid of diversity. For sure, living and dialoguing with those who resemble us is reassuring. But if people manage to taste the beauty and the richness of diversity, then the path leading to encounter will have already been paved. There is another misunderstanding about interreligious dialogue. Some people believe that the purpose of dialogue is to identify our common grounds. In reality interreligious dialogue is initiated when our mutual differences emerge and we learn to know them and embrace them without fear. Intellectual laziness also plays a role. Everyone expects that the Pope and al-Tayyib will regulate the problems in Muslim-Christian relations. But we should ask ourselves what we are doing to advance the dialogue. We are all protagonists of this central page in history. Everyone contributes to writing it, each at their own level. Can one be Christian without dialoguing? The incarnate God chose to engage in dialogue with humanity. To be Christian without engaging in dialogue is equal to being a Pharisee. The Church must do today what Christ did with history: He stepped out of eternity to identify with us and with our time. Evangelization today consists in dialogue. If not, we will all become major consumers of Christianity.